When the scoreboard flashed 10-0 in the fourth, some fans thought “no problem, we can come back. We’ve already seen record comebacks this week!” It’s one thing to dream about setting the record for biggest comeback in team history. After Terry Collins took out his four leading hitters, the replace-Mets did more than dream. They brought the tying run to the plate in the eighth and go-ahead run up in the ninth, only to fall 10-8. It felt like only a matter of time before the Mets’ paper-thin rotation would collapse. With Noah Syndergaard out with strep throat, Collins was left with two options. Sean Gilmartin wasn’t an inspiring choice for a spot starter. He only made one start in the big leagues before Saturday’s game. But the other option was Rafael Montero, whose best big league start this year involved six walks in five innings. Neither option was a safe choice for the Mets. Gilmartin gave up a walk, a single, and then served up a fastball for a three-run Maikel Franco homer. He responded by getting right in to another jam, walking Jorge Alfaro to bring pitcher Alec Asher up with two outs and the bases loaded. Asher singled to center to bring in two more runs and chase Gilmartin. Montero warmed up with a wild pitch and another walk to Cesar Hernandez. In what may be Saturday’s biggest surprise, that was Montero’s only walk. He struck out Roman Quinn to end the inning. 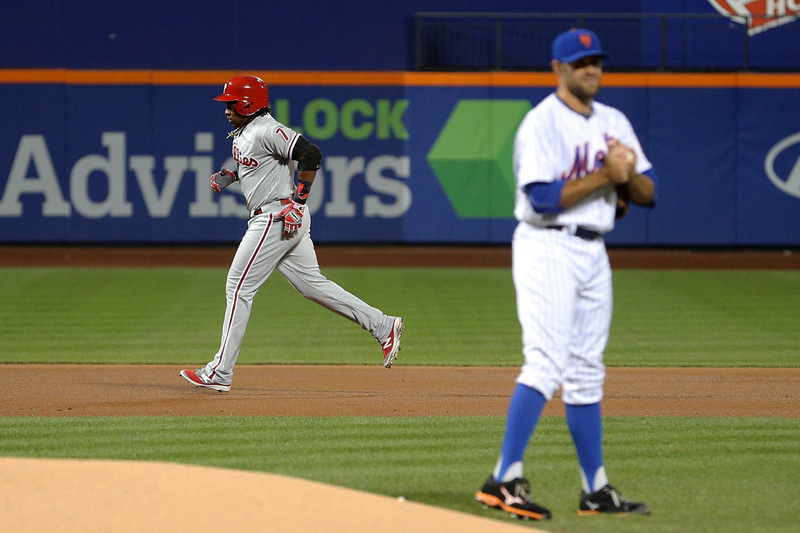 Odubel Herrera led off the second with a triple. It felt like the Mets were in for another onslaught of bad pitching, but Montero retired seven of the eight batters and was cruising in the fourth. Herrera broke through with a single, then Franco and Tommy Joseph singled. Darin Ruf homered for the second straight game (after not homering all season) and it was suddenly 10-0. Collins gave Jose Reyes, Asdrubal Cabrera, Yoenis Cespedes and Curtis Granderson one more at-bat each in the bottom of the fourth before pulling them all to rest for Sunday’s day game. Lucas Duda started the Mets comeback in the bottom of the fifth by running down the line to take advantage of Freddy Galvis’ poor fielding. (Duda also made diving plays in the field, showing no obvious back symptoms.) Travis d’Arnaud singled and Gavin Cecchini reached on a Franco error to put the Mets on the board. T.J. Rivera, Brandon Nimmo and Ty Kelly all got hits to give the Mets a total of four unearned runs before James Loney pinch hit and grounded out to end the inning. The rookies from Las Vegas went 6-11 with three doubles and drove in the Mets’ first six runs, striking again in the sixth and the eighth. Cecchini got his first major league hit in the sixth, an RBI double scoring Michael Conforto. Cecchini almost got his first home run in the eighth but settled for another RBI double. The crazy dream of coming back from a 10-0 deficit was suddenly real when Rivera came up as the tying run. Phillies setup man Hector Neris couldn’t throw his splitter close to the plate, but he made the adjustment, relying on his fastball to get Rivera and Nimmo out. Jay Brice finally got off the bench and gave Mets fans a reason to cheer for him in the ninth with a solo home run to make it 10-8. Eric Campbell drew an 11-pitch walk to bring Conforto up as the tying run with one out. He drew a 3-2 walk to bring up Duda. Could the Mets slugger have his own storybook walkoff homer? Would he flip the bat in celebration? Nope. Duda popped up and d’Arnaud hit a comebacker to end a wild game, just short of the record books. After using Johnny Wholestaff for the last two games, the Mets hope Robert Gsellman can go deep in the game. Both the Cardinals and Giants won, pushing the Mets back in to a tie for the wild card.